Hecklers disrupt Cameron's CBI speech Jump to media player Hecklers disrupt David Cameron's CBI speech - BBC deputy political editor James Landale captured the moment on his smartphone. The general secretary of the UK's largest union, Unite, has told BBC HARDtalk that the union is "pro Europe", but there needs to be a "balance with social Europe". 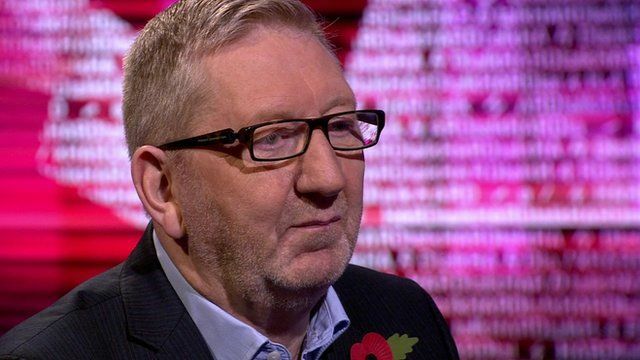 Mr McCluskey said that his union would "reconsider its position," if UK Prime Minister David Cameron got concessions to change rules on workers' rights. "My appeal to the CBI (Confederation of British Industry) is - stop sitting on the fence, tell the prime minister not to be attacking workers' rights in Europe," he added. You can see the interview in full at these times on BBC World News and in the UK on BBC iPlayer.